Awesome software with easy setup and excellent operation. Still haven’t got the upload portion of it working, but haven’t spent much time on it. I’m trying to install this software but I keep getting the internal server error message even though I think I’ve done everything in your instructions. Is there a common dummies mistake I’m making or an obvious pointer I’m missing? thank you for nice work.. It’s very helpful for my project. I encountered some installation problem.before make it work. I use Apache 2.2 / AppServ 2.5.7. At the first installation, Fancy speed test keep error 500 during executon. Then, I have to install Active Perl ( using the installation guide line of http://www.ricocheting.com/server/). After correctly installtion Active Perl, it works very nicely. // Kittivud. With my old Xitami+ActivePerl 5.8.8.820/Windows server, I must multiply upload time tv_interval by 5000 to get the correct Upload Speed measured. Download test works fine. Upload bar graph goes to about 80% mark and then hangs. Running it on a Linux Apache 2 system. Answering my own question: I had perms set wrong on the logfile. “Division by zero in /home/XXXXX/public_html/test/results.php” on line 115 & 110 and my upspeed only registers as “undefined” when the auto size option is enabled. This causes the Upload to use the max 5000kps test and register no results. I have all permissions set properly and am running upload.cgi out my my cgi-bin and I have the Time::HiRes perl module installed and enabled on my server. I have the upload.cgi and speedtest.cfg edited properly. I know this script works, I’ve seen it many times online and it’s fully functional. I just don’t know why it’s not working on either of my hosted servers (same provider though). I am on a hosted linux server with PHP 5.2.4 and Time::HiRes version 1.9708. Just curious if anyone else had the same issue and found a resolution. Much appreciated if anyone would share. details that might help pinpoint the problem. I followed the instructions here for installation of SpeedTest onto a Ubuntu 7.10 server running Apache2 and PHP5 with Time::HiRes installed. When I attempt to access the bandwidth test I continue receiving 500’s. I was concerned that the files: header.html, footer.html, & welcome.html DO NOT EXIST! I thought those missing files could cause the 500’s so I created those files but still no go…. Orignally ‘upload.cgi’ was located in ‘/var/www/web1/web/speedtest/’. While in this location if I ran ‘perl -x upload.cgi’ I would receive no errors no nothing- had to CTRL-C to return to the CL. So I decided re-locate ‘upload.cgi’ to /var/www/web1/cgi-bin/’. Below is my setting within ‘upload.cgi’ pointing to ‘speedtest.cfg’. I have also created the MySQL db using PHPMyAdmin and added the table. Defined the db name and credentials within ‘speedtest.cfg’ but I continue to receive 500’s. Likewise with ‘upload.cgi’ living in ‘cgi-bin’ when I run ‘perl -x upload.cgi’ no errors no response- CTRL-C to access CL again. If anyone could help me with some incite or possibly tell me what is the leading cause of failure I would appreciate it greatly. After spending too much time running commands in perl and receiving absolutely no errors I decided something a bit more bold was required to make this app work on my server! In all a pretty cool little tool, I wonder is Brandon is actually testing people’s abilities with the mis-named files? I installed the speedtest onto a Centos web sever running Apache 2 and PHP5, but I could not get the upload portion to run. I put the upload.cgi file in the cgi-bin, ran the test, and only got the upload.cgi text file in the web browser. For some reason the system does not want to execute the upload.cgi file. Can someone please give me some suggestions on what I could be doing wrong. However, I am still getting the same result; What else do you think it could be? Thanks for your help. This is a nice tool – I installed and it seems to be working – but somehow the upload speed cannot be correct, I ran a couple of times on my LAN and get speeds between 500-600 – would be good if that is the case, but I don’t think so -what could be the reason for this problem? I don’t get any errors in apache error log nor from your tool. it seems that no upload is done at all, download works fine – any guess where the problem could be? Do you know what would cause this error? PHP Notice: ob_flush(): failed to flush buffer. No buffer to flush. in /var/www/html/download.php on line 108. What operating system did you use run the speed test? 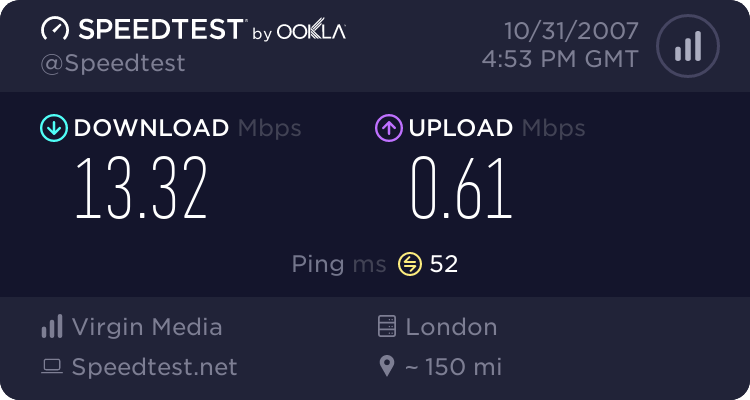 Hi, i’m trying to get your speedtest up and running, however the timing seems to be off. Running on CentOS4 with LiteSpeed btw. I experienced the same problem of your (upload cgi cannot execute). I use Apache 2.2 and php 5 (window xp). To solve my problem, I am needed that to install ‘Active Perl’. You can find software and installation guid from http://www.ricocheting.com/server/. After correctly installtion Active Perl, My speed test works nicely. Thank you Brandon for this software. I am trying to run your application on IIS 5.1. The download test runs smootly, but when I attempt to run the upload test I keep receiving a Cgi timeout message. it doesn’t help if I increase the timeout period for Cgi. Can I run this application on IIS at all or it can be run only on Apache? I am using Active Perl and PHP5. Should I change something in the code? Everything is working fine expect that the progress bars during uploading/downloading aren’t shown. pretty_version is set to 1 and I can see the progress bars if I use your example speed test server. No error are shows in apache log. I verified the script gets accurate data by comparing against several other internet speed tests. Would be nice if I could get it to work across the LAN (100Mb and Gb) but I needed it to test broadband connectivity to our headquarters via IPSEC. For this it works great!! HTTP Error 405 – The HTTP verb used to access this page is not allowed. I have tried several things but no luck. An HTTP POST is a pretty common operation, and I’m not sure why it would not work by default. I found this website by accident and tested the Speed-Test. I got comepletely wrong speed-values (too high). can somebody help me with this error? Great tool. I very much appreciate the time that it took to create this. Thanks for an excellent tool. First of all, thanks for creating this application, was looking for something basic like this. When i start the test the download bar reaches 100%, the upload bar reaches 100% but nothing loads after that, except for a CGI timeout error after some time. I’m running IIS 6.0 with basicaly every script extension installed and working. Any idea what causes the timeout? I’ve never had an IIS server to test on, but I would suggest looking for any log files generated by the server to see if they hint at what the problem might be. why am I getting this error. can you help me to sort this out. I have tried to run perl on upload.cgi and I’m getting below mentioned error, any thoughts. Can’t locate strict.pm in @INC (@INC contains: .) at upload.cgi line 12. BEGIN failed–compilation aborted at upload.cgi line 12. The graph for the upload is just an estimate, and your upload is probably finishing faster than it has estimated. This is an excellent script! working on trying to automate a call to it so that I can track daily statistics of internet speed. Will post if I figure out a way to do it. Question: What determines the file size used for testing? We are mainly using this test on our wireless network. It seems the file size changes in direct proportion to signal strenght. Possibly adjusting for packet loss is this the case? It does a small initial download/upload test to get a rough idea of the speed. Then it calculates the file sizes to use so that the ‘real’ test will take around 16 seconds. The initial download/upload size is set to 50k down and 10k up, although that can be changed in the config file. I don’t have any magical reason for using those sizes/times. I think I did some trial and error when trying to decide on some appropriate numbers, and it seems that it has worked out well. I was using this initially in a wireless network as well, so it should be pretty well suited for you. I managed to install and run the script flawlessly, however I observed my download results were inaccurate (too low when compared with other speed test script installed on the same server). Upload results seems accurate. I’ve checked the config file but find no clue where to tweak the script. Help is much appreciated. TIA. @dodi – I’ve generally had pretty accurate results for speeds up to about 5 Mbps. Between 5-15 Mbps is in the right ballpark, and faster than that, the browser has trouble keeping up, so it reports it as slower than it really is. So, I have two of these that where active and working – but for some reason – it has just stopped working. It seems to just stop on the download.php page – My MAC shows no errors – but my PC shows errors on line 933 – object expected, line 1758 – object expected, and line 1764 char5, object expected. This is the case on two different servers. Just a quick update – I have found that the header.html file will cause some weird issues if there is bad coding in it – so BeWare!!! – May help someone else – I was trying to get some tables to work in it – but it may have freaked out some other code.